So how did fabric end up in my art? As you might imagine, I was already very fond of and familiar with fabric, long before I started doing any of this layered fabric art. Like many of us fabric fiends, I learned to sew clothing at a young age - that gets you started. My mother taught me what she knew, although she never really caught the sewing bug like I did. She had one of those old, black Singer sewing machines. It just sewed a straight seam. Nothing fancy. It didn’t even do a backstitch. You had to lift the presser foot, pull your work forward and stitch over what you just did. Crazy. Since my mother never did much sewing, I only learned the basics. It really took me many, many years to get very good at it. I was busy with painting, photography, biology. Although I did continue to sew. My incentive was that I was really tiny. It was (and still is) extremely difficult to find clothing that fits. And, although I have little patience for some things, I seem to have patience for sewing. I’ve always enjoyed the act of sewing, rather than just wanting the end result. That is a must for anyone trying to learn to sew. You’ve got to be willing to take the time to properly cut the fabric, to line things up right, sew a straight stitch (and enjoy it), and to pull out stitches when you make a mistake! Well, enough of that. 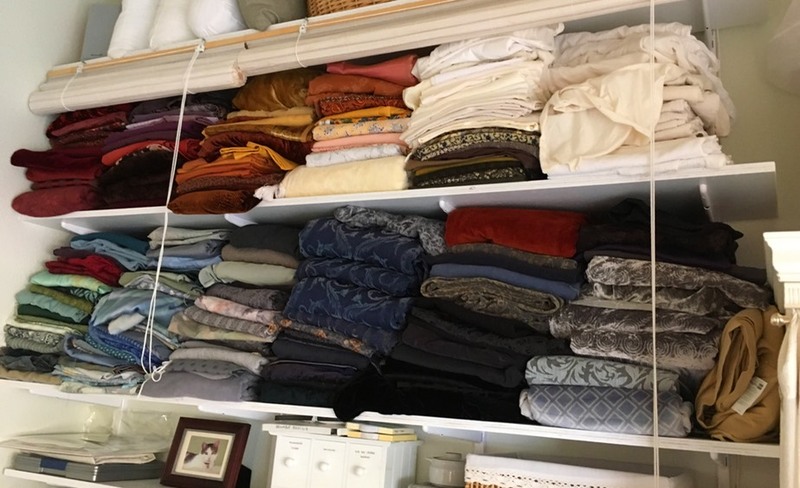 Over the years, I collected fabric. I would go to a fabric store, and see all the possibilities. I made many garments, flawed though many of them were. I learned from my mistakes. And I have always loved costuming. Knowing how to sew was a tremendous advantage for that. Halloween was my favorite time of year. I still love Halloween, but I also became involved with the Renaissance Faires. 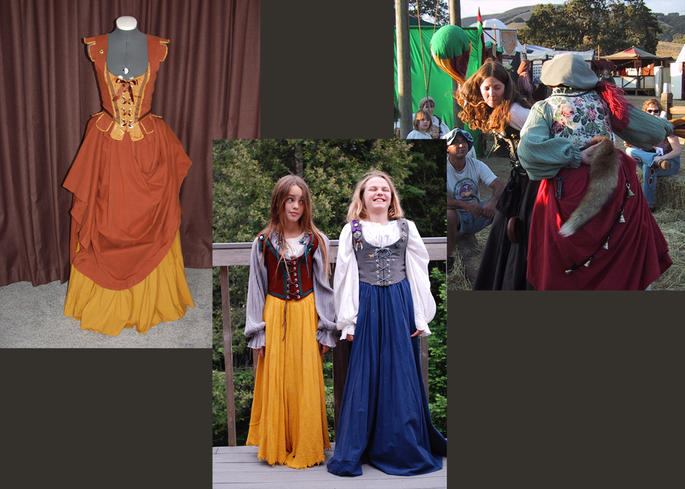 Later, I created outfits for other events, such as the Dickens Christmas Fair, and various theme parties and events. What fun it has been!! Below are a few photos of some of these outfits. Some Ren faire stuff. That last pic doesn’t really show my outfit all that well, but I thought it was a fun pic so there it is. I made all the outfits here except my friend, Nancy’s, whom I am about to swat with that pillow. Looks like a winning toss. We both ended up on the ground. Below here, you see me wearing my Victorian day dress. I also have a ball gown in a muted lavender satin. Sorry, I can’t find a picture of that. 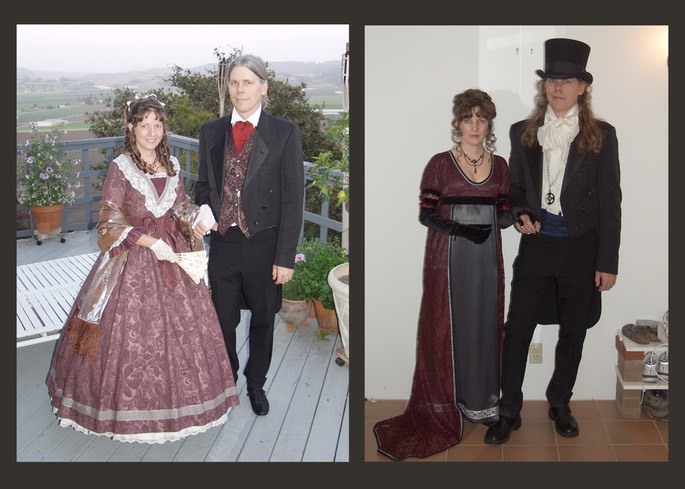 On the right, I am in my early 19th century Empire dress, made for the Vampire Ball, which is why it’s red and dark and not in the usual pastels like you see in the movies. Can I call these, ‘period’ costumes? Perhaps. The first photo is a costume I made for a Y3K party. The second is my Steampunk outfit. I even made the hat - the decorations anyway, which included a bunch of stuff I found at the dump. And Halloween. I have made more Halloween costumes than I can possibly recall. That would require an entire website! But here are two. That’s me on the right in the first photo, as Kali. 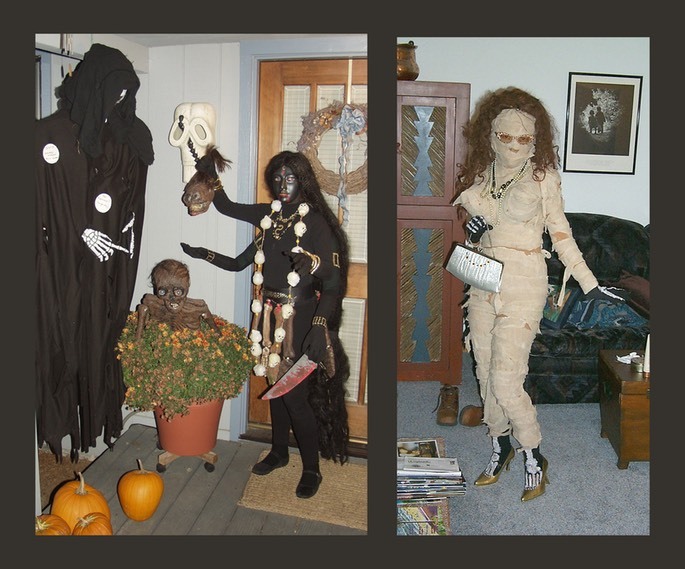 And me in my retro mummy outfit in the second photo. 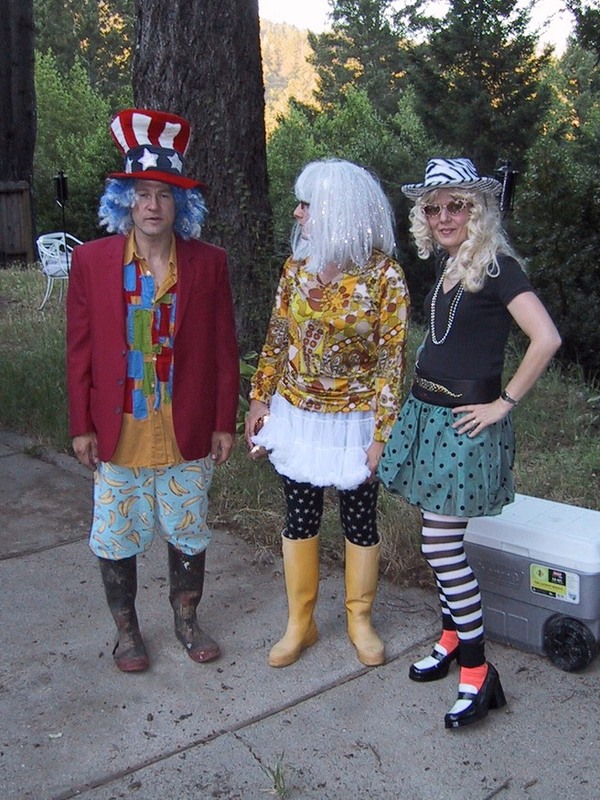 Just for yucks, here I am all decked out for the Ugly Prom, held at the Ugly Mug in Soquel, CA. That’s me on the right. I didn’t actually sew anything here, just threw some old junk together. 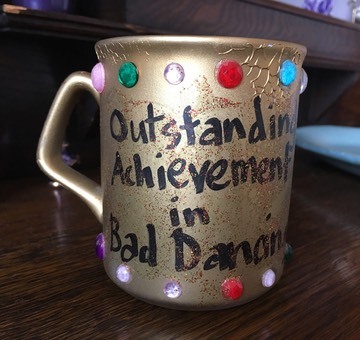 I won the ‘Bad Dancing’ contest at the Ugly Prom. Even got an award for it. My current fabric stash. This is not my art fabric, that’s yet another huge stash! 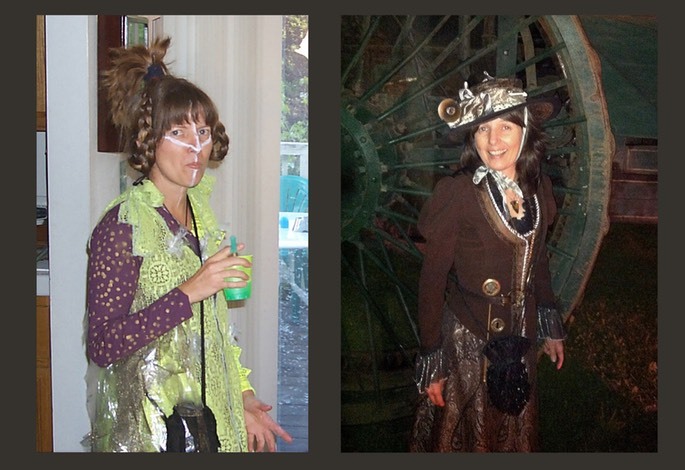 I also did some costuming for the local theaters when I was living in Humboldt county. Not sure I can show pictures here (property rights and all that), but you can see some of them on the website for North Coast Repertory Theater in Eureka, CA. You have to go back many years! But they do still have some of the old photos from the plays I costumed. Here are some links (the photos are mixed in with other plays - click on the play name toward the top). Fiddler on the Roof, She Loves Me, Gypsy. Plus I made a few outfits here and there for other plays and other theaters. It was extreme fun and extreme exhaustion. Not sure I could handle it now. To view my layered fabric mountainscapes, please click here.